Sprinkle oil onto bottom of 9x13” baking dish. Slice lemon in half. Set one half aside. Slice the second half into very thin slices. Put sliced red pepper, red onion, garlic and sliced lemon in bottom of baking dish. Sprinkle with salt and black pepper (or Montreal seasoning). Lay salmon fillets on top of the vegetables. Squeeze lemon juice from the other half of the lemon on top of the fish. 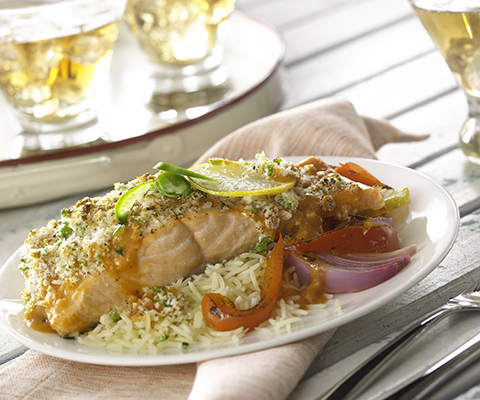 Pour the Classico® Creamy Tomato and Roasted Garlic Sauce on top of the fish. Sprinkle diced jalapeño pepper and panko bread crumbs on top of the fillets. Cover dish with aluminum foil and bake for 30 minutes or until internal temperature of the fish reaches 160°F. Remove foil and broil for 5 minutes or until the bread crumbs become golden brown. Serve with roasted potatoes or over a bed of basmati rice. If you are setting out or passing a tray of skewered appetizers, provide some sort of container for the used skewers. You don’t want people putting them back on the tray.